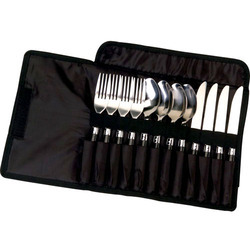 This 12 pcs cutlery gift set is elegant for gifting. This set accompanies in it 3 pcs each of dinner spoon, dinner forkdinner knife. The type spoon can also be replaced according to ones choice. 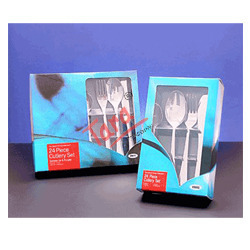 This 24 pcs cutlery gift set is elegant for gifting. 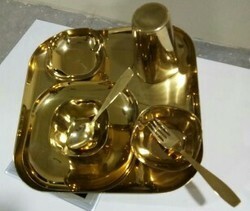 This set accompanies in it 6 pcs tea spoon, 6 pcs dinner spoon, 6 pcs dinner fork, 6pcs soup spoon. The soup spoon can also be replaced by 6 pcs dinner knife according to ones choice. 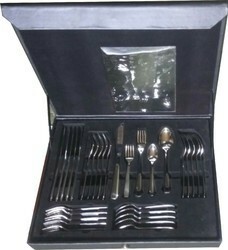 This 12 pcs cutlery gift set is elegant for gifting. 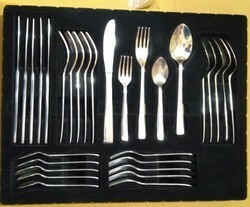 This set accompanies in it 6 pcs dinner spoon, 6 pcs dinner fork. The type spoon can also be replaced according to ones choice. 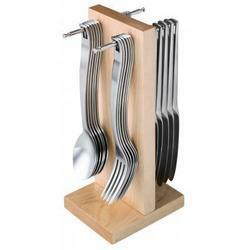 This is 24 pcs hanging cutlery set for your dining table. Ideal for giving gifts to your friends, employee and for your home. We offer aesthetically designed cutlery gift, which are highly admired for their finest finish and superior polish. 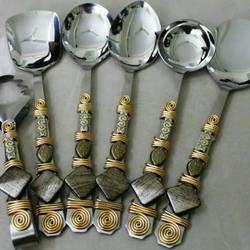 Fabricated using best quality stainless steel, this cutlery gift set consists of tea spoons, dessert spoons, soup spoons, table forks, dessert forks, table knives and dessert knives. 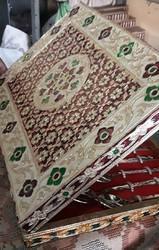 These gift sets are also customized as per the specific demands of the clients. 8) 3 pcs serving spoon. 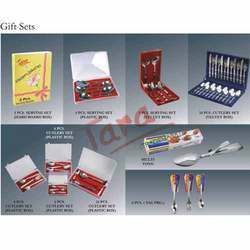 We hold expertise in making a wide range of Cutlery Gift items like Dessert Set. 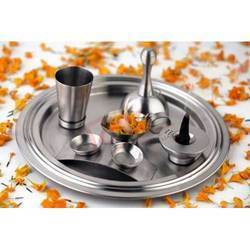 All cutlery sets and gift sets of our company are manufactured using superior quality stainless steel that is procured from the noted vendors. 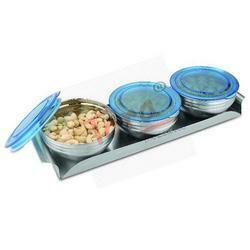 Our cutlery products are suitable for serving cooked and dry foods. 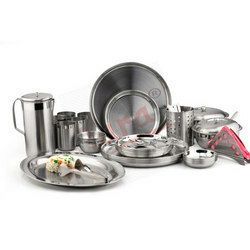 Food serving products such as cup, plates, bowls and glasses are widely used in Household kitchens, Restaurants, Hotels, Railway canteens, College canteens and others. Cooking and kitchen products of our company are acknowledged for the properties like light weight, corrosion resistant finish and sturdy construction. We are involved in manufacturing and supplying a wide range of Air Tight Bowls. 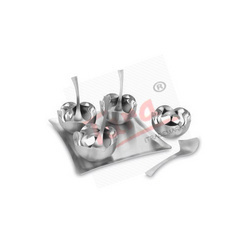 Our bowls and cups are made of superior grade stainless steels. These kitchen products are widely used to keep the cooked and raw foods in safe and hygienic condition. 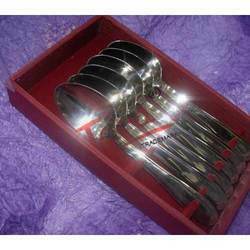 Our cutlery sets are widely used in Birthday Parties, Marriage Anniversary functions, Wedding functions and Public meetings. All steel utensils of our company are designed strictly on the line of the industry specified quality norms. 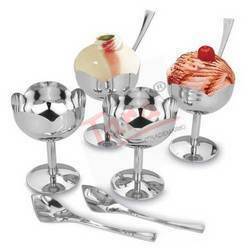 Our company is an eminent manufacturer of an extensive array of stylish utensils that includes Ice Cream Set. These are cutlery items used in preparation of ice creams of various sizes and designs. An ice cream set consists of two, three or more cups/ bowels of uniform size and a plate. In general, ice cream sets are made of steel, copper, glass, plastic and other materials. Our kitchen and food storage items are widely appreciated for the unmatched properties like superior tensile strength, gorgeous design and corrosion resistant finish. This 5 pcs serving set accompanies 10 inches long serving spoon viz 1 pcs each of serving soup, serving pickle, serving rice, serving square, serving pan. Available in design orchid, olympus, prince, magestic, symphony. This 6 pcs cutlery gift set comes in a very fancy box which enhances the beauty of the cutlery and is the best gift to choose in. 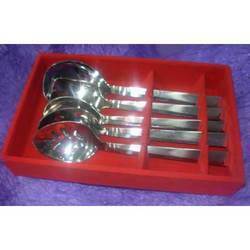 This extends to % pcs serving set and 24 pcs cutlery set too. 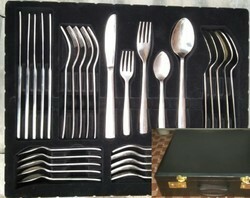 This is 24pcs cutlery set, 6 pcs each of tea spoon, dessert spoon, dessert fork and dessert knife. these are available in any of the design in the flatware category. 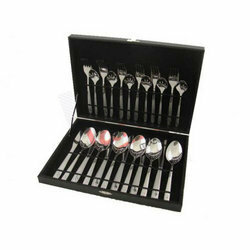 This 24 pcs cutlery set include 6 pcs each of tea spoon,dessert spoon,dessert fork and dessert knife. 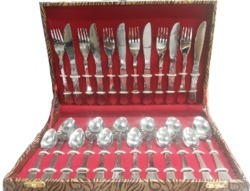 This 72 pcs cutlery gift set is elegant for gifting. 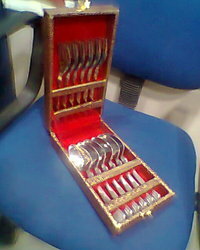 This set accompanies in it 12 pcs tea spoon,12 pcs Tea fork. 12 pcs dinner spoon, 6 pcs dinner fork, 12 pcs dinner knife . 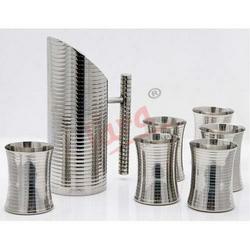 Backed by our modern infrastructure facility, we offer high quality oxidized gift in various attractive shapes and sizes. Fabricated from superior quality steel, every piece of the set is intricately designed and finely polished. 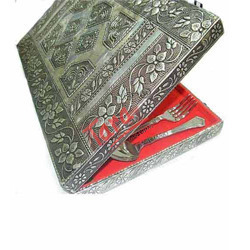 Available in delicately crafted box, these oxidized gift sets make a perfect wedding gift. 6 Pcs Dessert Knifes OR 6 pcs Dessert soups. 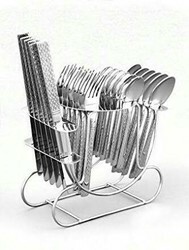 Looking for Cutlery Set ?